Instead of specific words of advice, PokerCoach calls our attention to mistakes we make according to GTO strategy, which is a handy tool in avoiding –EV moves in-game. After downloading the software from the official PokerSnowie website, you gain access to the 10 days trial version. We tested the software this way and needed nothing else but to give a name, e-mail address and a password. Following installation, the software can be launched and you are welcomed by the Quick Start menu, explaining the use of the tool in four easy steps. Simply click the “Import” button in the top right corner of the PokerCoach client screen and give the access route to your hand history database folder. PokerCoasch will instantly import your hand histories. After you import your hands, the sessions appear in the client, where you can select the ones the hands of which you want PokerCoach to analyse. Click the “View analysis” button to have the software reveal your mistakes, according to the GTO strategy. Under the “Statistics” tab, you can check to what extent your game correlates with the GTO strategy. You are given a score according to the number of mistakes made and the resulting loss of EV. You have the option to review your entire session street by street or hand by hand or to select hands where the software has found an error. You can review these after clicking on “Errors” or “Blunders”. When reviewing your hands, you can choose from four different options: “Moves” shows you every action, including those deemed correct. “Errors” lists each of your wrong moves and “Blunders” reveals only the largest, extremely –EV mistakes. With “Showdowns”, you can review the hands that were played down to tabling the cards. 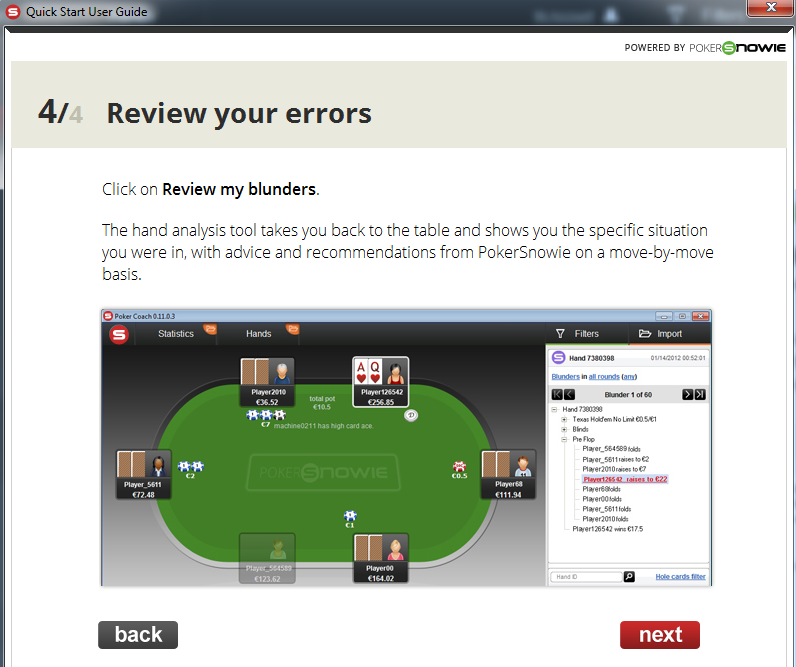 When reviewing a mistake, PokerCoach tells you what would have the correct move been. The software takes into consideration the optimal balancing in the GTO strategy; for example, in the hand below, we called from position with A5s in a NL2 game, which the client evaluated as wrong; according to PokerCoach, fold would have been correct in 72% and raise in 28% of the possible scenarios. The single biggest shortcoming of PokerCoach, in our opinion, is that it fails to go beyond telling what the correct move is in a given situation. It does not provide explanations, which makes it a lot harder to be able to learn from our mistakes. It does not give ranges, either, which means we do not get to know what the lowest hand is with which it is worth 3-betting in a given spot. We cannot modify the hands, creating alternative scenarios to see if our wrong raise from MP would have been optimal from the Button or if the villain has a smaller stack. We are faced the GTO facts relevant to the specific hand, and that is it. Still, it can be immensely helpful to eliminate recurring mistakes that reduce our EV. A way to bypass these limitations is to manipulate the hand history files, rewriting them to see what changes. Of course, this is hardly a convenient method and it would be better to be able to adjust the hands to our liking through the application. Also, PokerCoach recognises only three steps of bet sizing: half pot, pot and twice the pot. Developers reflected on this issue as non-critical to the validity of the analyses but they still plan to include a 0.75 pot bet step. 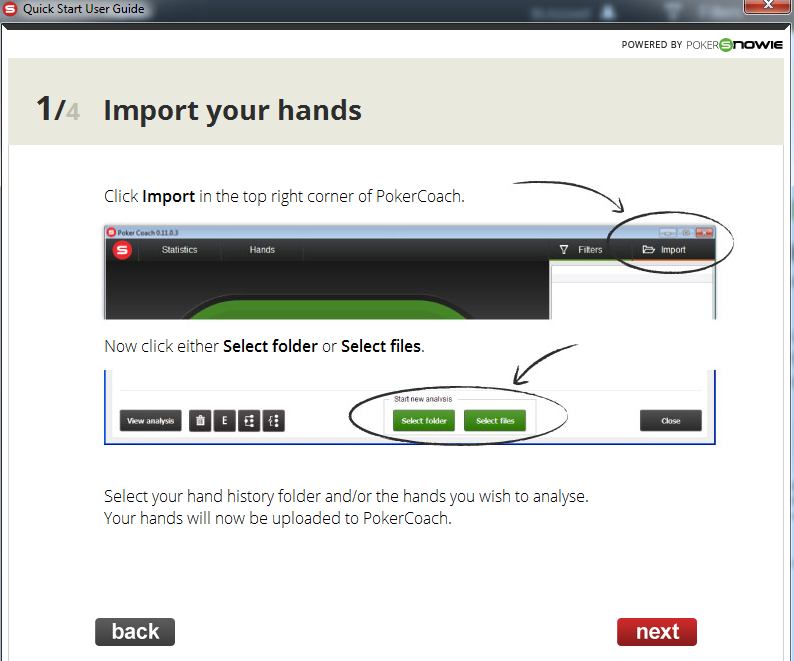 You can use PokerCoach to analyse hand histories after your sessions. The software cannot be run together with any poker client; if we launch one, it automatically shuts down. The user interface is easy to navigate and the program does not require a lot of computing capacity. Users are given Credits to “pay” for the individual analyses. Different amounts of Credits are available in three packages: “Bet”, “Raise” and “All-in”. Pay €39 to get 20,000 Credits for a month in the “Bet” package; if you subscribe for three months, the total fee is €89 and you can also pay €249 to get the 20,000 Credits each month through an entire year. There are 45,000 Credits in the “Raise” and 100,000 in the “All-in” package in each month for €79/€169/€499 and €159/€399/€999, respectively. The number of Credits deducted from your account depends on your stakes. For hands under NL50, each hand costs 1 Credit; hands between NL50 and NL200 cost 2 Credits and over NL200 4 Credits each. PokerCoach is definitely worth a look; a short test period was able to reveal mistakes in our play that were surprising; obviously, significantly less will hit CG regulars as new. In all, it is definitely worth trying out, at least for the 10 days trial period, during which you can decide if it is worth spending that kind of money for you. Even within 10 days, a number of significant, recurring errors can be revealed in your game. The trial offers 2,000 Credits to use for analysis. Those who worry that fish might be able to improve a lot using just this software; do not. With no explanations added to the specific moves, most players can get little out of the program’s suggestions, failing to understand the underlying thoughts.